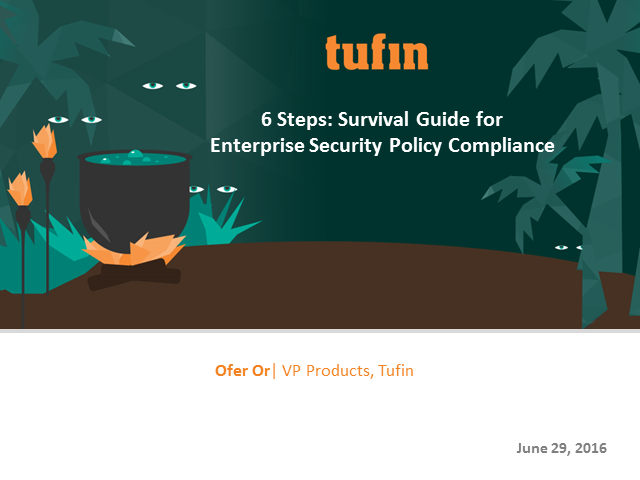 Every enterprise needs a survival guide for compliance. The risk associated with cyber security has a big spotlight on it today—and it’s become a Board-level topic for many enterprises. Compliance with cyber security requirements has transitioned from a "check the box" mentality to a stringent program whereby regulatory requirements and standards as well as enterprise policies and best practices are diligently met, continuously enforced and proven through regular audits. Yet, preparing for audits and maintaining audit readiness takes valuable time and resources– and has become quite a burden! Join this session to learn about the 6 steps for surviving in today’s compliance jungle. Cloud security isn’t new, but some of the approaches are. Whether your approach is lift and shift or cloud-native security, we now know more about the strengths and deficiencies of each approach through publicly disclosed breaches. Join Tufin’s security experts Colby Dyess, Ethan Smart and Dan Rheault on April 24th for a deep dive into how organizations are approaching security, how security-mature organizations are applying improvements, and an overview of key lessons learned from the frontlines. Register for this webinar today. Server policy cloning becomes a bottleneck when deploying or migrating applications. Register now for the Tufin Orchestration Suite R19-1 GA webinar. Una red segmentada hace que las políticas de seguridad sean eficientes, permite un estado de cumplimiento continuo con el mínimo esfuerzo y ofrece opciones de mitigación para los ataques cibernéticos. ¡Pero la segmentación de la red no es una tarea fácil! - Framework para la segmentación. - Directrices para la aplicación y mantenimiento de una red segmentada. Ihre Teams haben Schwierigkeiten, mit der Häufigkeit von Netzwerksicherheitsanfragen Schritt zu halten, während sie gleichzeitig versuchen die Agilitätsinitiativen Ihres Unternehmens zu unterstützen und die Sicherheit zu wahren. Sie kennen die Vorteile der Automatisierung, fragen sich aber wahrscheinlich: "Wo fangen wir an?" • Wie können begrenzte Ressourcenherausforderungen überwunden werden? Join automation expert Joe Schreiber on March 20th as he shares his experiences automating himself out of a job (in a good way), and discusses where to start and how to avoid risk. Got questions? Send them to Joe ahead of time to be included in the discussion. Una rete segmentata rende operativa le policy di sicurezza, consente uno stato di compliance continua con il minimo sforzo e offre opzioni di mitigazione per gli attacchi informatici. Ma la segmentazione della rete non è un compito facile! Un réseau segmenté opérationnalise votre politique de sécurité, permet un état de conformité continue avec un minimum d'effort et fournit des options d'atténuation des cyberattaques. Mais la segmentation du réseau n’est pas une tâche facile ! The growing adoption of DevOps practices and the speed of change that accompanies it leaves security teams in the dark. DevOps is, in fact, interested in security; however, they don’t want to slow down to meet the pace of traditional security practices. Are you struggling to gain visibility and ensure that all applications adhere to security policies? We promise to deliver an eye-opening educational experience. Why automate? Why Now? Automation is critical to your digital transformation, essential for reducing your attack surface and mandatory to ensure you have continuous compliance. This webinar will review how you can begin automating network security operations and explain why it’s mandatory to focus on policy-based change automation. Can security become an enabler for your business? As a security leader tasked with digital transformation, you face real challenges to increase operational efficiency while protecting yourself from cyber threats. Register now for this expert session you won’t want to miss! Avez-vous déjà eu l'impression que les changements à effectuer sur vos firewalls étaient trop longs ? Si vous gérez un réseau vaste et complexe, il est probable que vous passiez un temps précieux et des efforts considérables pour vous assurer que les modifications sur vos Firewalls sont bien mises en œuvre et en accord avec les bonnes pratiques sécurité de votre organisation. L’utilisation de processus manuel peut prendre plusieurs jours afin d’appliquer la globalité des changements attendus. Afin de répondre aux exigences de votre organisation (SLA) tout en restant agile, il est nécessaire d’automatiser ces processus dès les phases d’analyse, de conception et de mise en œuvre de vos modifications. Dans ce webinar, nous démontrerons comment vous pouvez réduire le temps nécessaire à la mise en œuvre des modifications de vos Firewalls tout en assurant un processus sécurisé, tracé et audité. Inscrivez-vous dès maintenant pour connaitre les bénéfices de l’automatisation au sein de votre environnement. ¿Has tenido alguna vez la sensación de que los cambios en los firewalls tardan demasiado? Si estás gestionando una red extensa y compleja, lo más probable es que gastes un tiempo y un esfuerzo valioso en garantizar que los cambios en los firewalls se aplican de forma segura y sin errores. Depender de procesos manuales puede hacer que los cambios lleven varios días. Para poder cumplir con los SLAs y los requerimientos de agilidad en el negocio, es necesario automatizar el análisis, el diseño y la implementación de los cambios. ¡Regístrate ahora para comenzar a automatizar cambios en los firewalls y adelantarte al negocio! Wenn Sie ein grosses und komplexes Netzwerk unterhalten, sind die Chancen gross, dass Sie viel Zeit und Anstrengung aufbringen müssen, um sicherzustellen, dass Firewall Änderungen sicher und akkurat implementiert werden. Bei manuellen Prozessen kann eine Änderung Tage oder Wochen bedeuten. Um die SLA’s und die Anforderungen an die Agilität zu erfüllen, müssen sie die Änderungsanalysen, das Design und die Implementierung automatisieren. In diesem Webinar zeigen wir Ihnen, wie Sie die Zeitdauer für Firewall Änderungen reduzieren können. Unter Beibehaltung eines sicheren und nachvollziehbaren Prozesses. Registrieren Sie sich jetzt für das Wbinar über Firewalländerungen! Ready for full automation for next generation firewalls (NGFWs)? Eager to achieve a greater understanding of your risk? Join the Tufin product team on January 16 to learn how customers using Tufin Orchestration Suite R18-3 GA will master their Network Security Policy Management through increased automation and additional risk reporting. Register now to learn how automation increases your organization’s efficiency and improves risk management processes. Breached. Hacked. Cyberattack. These are all words that dominated headlines in 2018. While many of the attacks that prompted these headlines may have been avoided in hindsight, enforcing security policy across the legacy physical network is challenging. Furthermore, “cloud first” strategies and the increased adoption of containers introduce new risks to organizations and raise new security concerns that need to be anticipated. Join us on December 18 for a webinar with Ethan Smart, Senior Solutions Engineer, to learn from the mistakes of others in 2018 and how to avoid making them – and the headlines – in 2019. Join this live panel discussion with experts at AWS re:Invent 2018 for an in-depth look at the future of cloud, application security, and transitioning from DevOps to DevSecOps. This live panel will be streamed directly from AWS re:Invent in Las Vegas! Join us for live Q&A from the comfort of your desk. Join this one-on-one interview with Reuven Harrison, CTO and Co-Founder of Tufin, for an in-depth discussion on DevOps and DevSecOps in 2019. - What is your definition of DevOps and why is it different for different organizations? - What is the rate at which DevOps is being adopted? - Is DevSecOps just DevOps with Security sprinkled in, or is there more to it than that? - How can your organization respond to DevSecOps needs? - What are some of the most common issues when shifting to DevSecOps? This on-camera interview will be recorded directly from AWS re:Invent in Las Vegas! Tune in from the comfort of your desk and get all of your DevOps questions answered. ist Ihre Netzwerktopologie flacher als die Schleswig-Holsteinische-Gebirgslandschaft? Wir können Sie dabei unterstützen Ihr Netzwerk in effektive Sicherheitszonen aufzuteilen und haben eine Lösung, welche die Einschränkungen der Kommunikation zwischen den Zonen, Hersteller- und Plattformunabhängig, sicherstellt. How do you protect your network? It’s getting more and more difficult to identify, analyze, and mitigate vulnerabilities and threats. Register today for a better understanding of how to enforce security policy throughout all your security operations. Ist Ihr Firewall Regelwerk schwerer zu lesen als die Assembler Code? Tufin kann Ihnen helfen ein bestehendes Firewall Regelwerk aufzuräumen und von nicht mehr benötigten Regeln und Objekten zu befreien. Wir zeigen Ihnen exklusiv welche Werkzeuge Ihnen helfen Transparenz und Compliance sicherzustellen. Melden Sie sich heute noch an und tragen den Termin in Ihren Kalender ein! Tufin® is the leader in Network Security Policy Orchestration, serving more than half of the top 50 companies in the Forbes Global 2000. Tufin simplifies management of some of the largest, most complex networks in the world, consisting of thousands of firewall and network devices and emerging hybrid cloud infrastructures. Enterprises select the award-winning Tufin Orchestration Suite™ to increase agility in the face of ever-changing business demands while maintaining a robust security posture. Tufin reduces the attack surface and meets the need for greater visibility into secure and reliable application connectivity. Its network security automation enables enterprises to implement changes in minutes with proactive risk analysis and continuous policy compliance. Tufin serves over 2,000 customers spanning all industries and geographies; its products and technologies are patent-protected in the U.S. and other countries.